"Some want to live within the sound of church or chapel bell; I want to run a rescue shop within a yard of hell" (C. T. Studd). "I have but one candle of life to burn and I would rather burn it out in a land filled with darkness than in a land flooded with light" (John Keith Falconer). When I have mission teams to work with, I let them decide how they want to do their mission here. If they want suggestions from me, I encourage them starting out by taking the tours of the downtown Mormon sites. They tour Temple Square, see the movie called Joseph Smith The Prophet of the Restoration in the Joseph Smith Memorial Building, see the Conference Center, the Museum of Church History and Art, Brigham Young's house and grave, and view the Salt Lake valley from atop the Church Office Building. Typically, the teams cannot stomach taking all the tours, and this creates quite the impetus to start evangelizing. After the tours, the teams get to experience downtown ministry. They break off into small groups and surround Temple Square. I basically allow them to minister however they would like--whether that be by trying to go back into the Square to talk to the LDS sister missionaries, by passing out tracts outside the Square, by holding up signs, by praying, by getting into conversations outside the Square, by preaching, or by utilizing a combination of ways. The other days of ministry consist in door to door, and ministry at and around Brigham Young University. These generally are more personal times of evangelism. I briefly train the teams to use a sample approach relevant to the respected situation. Typically door to door is done around a church neighborhood that the group stays at and also outside BYU. An attempt is made to leave a tract at each door, to share the gospel if someone will listen, and to invite people to visit the local Christian church. 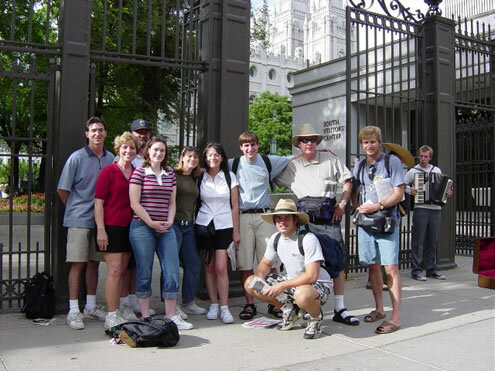 Many of the college/high school missionaries that come up enjoy the experience at BYU the best. They relate to the BYU students who are very accommodating and gracious, and usually more thoughtful than other LDS. In addition to helping the teams with their evangelism, I also get to play recreational tour guide. There are many scenic drives and hikes to take here. And during the annual Mormon Miracle Pageant in Manti (HIGHLY RECOMMENDED! ), we do fishing, boating, and swimming. These all provide good "breathers" for individuals who find themselves spent on the mission field. 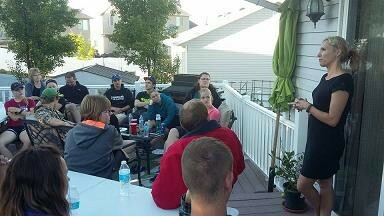 Tara shares her story to the Heartland EV Free Church mission team (June 1, 2016)My wife Tara and I also enjoy hosting teams at our home for an evening. We provide a barbecue, training, and Tara shares her story of coming out of Mormonism and coming to Christ. As for costs, I do not charge for my services, but would like the teams to provide for my meals while I work with them and to consider making a donation to my ministry Courageous Christians United. Teams are also responsible for bringing up their own tracts for door to door ministry (I encourage the use of my Seven Differences between Mormonism and Christianity). If you or your church group would like a good challenge doing some mission work around the Salt Lake City area, please do not hesitate to contact me.